Do you need a style guide? The answer will always be the same – a resounding yes. Designers often pass up the need for one but, if you want to create a professional and trustworthy branding identity, consistency is key. That goes for small, solo ventures and larger outfits alike. No matter what sort of business you conduct or on what scale, the last thing you want is to confuse your client base by producing materials differently each time. 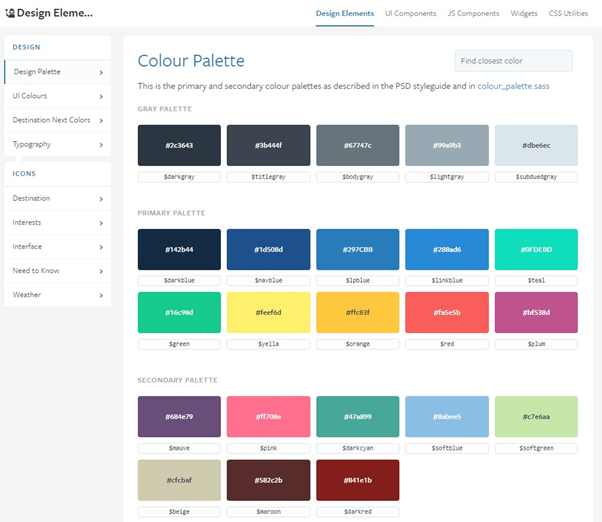 Style guides don’t take long to put together but will save you time in the long run. Setting clear parameters for how your marketing materials should present both on and offline is a great way to solidify your branding identity in terms of the way you see yourself in the marketplace and will enable you to envision more scope into the future. A comprehensive brand bible also really comes in handy when you’re dealing with new employees and freelancers by critically ensuring everyone is on the same page. Nobody wants the impact of their long crafted, perfectly constructed logo ruined by incorrect placement or sizing. SO, WHAT EXACTLY IS A STYLE GUIDE? Usually a one page document, a Logo Style Guide includes all info relating to your logo – the logo itself, variations on the logo, colours and fonts. 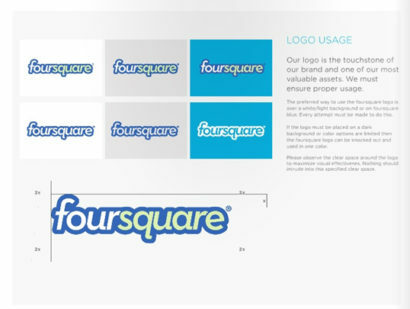 Part of Foursquare’s Logo Style Guide. Read their full brand bible here. A Web Style Guide involves specific information for your website such as site colours, button styles, icon styles and typography. Some also include specifics on page layout, spacing and site architecture. A Brand Style Guide is more in depth and will include your logo usage, colour, imagery, typography and information about your brand’s personality and tone of voice. Often, taglines and key phrases will also be covered. 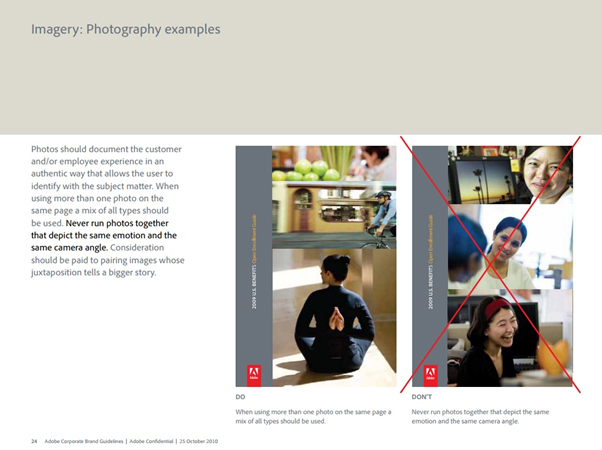 Part of Adobe’s Brand Style Guide. View the full document here. The best way to learn about style guides is to read through a few. You can view and download more than 60 different style guide examples from LogoDesignLove. Think about the way your target market would be want to be communicated when putting together yours. And always remember that brand identity is not set in stone. Keeping your image fresh requires continuous improvement and realising that successful brands adapt and are fluid.